Self-publishing is AWESOME, and it’s a better fit for certain personalities and even content (um, social media? ), but we must be educated before we publish. 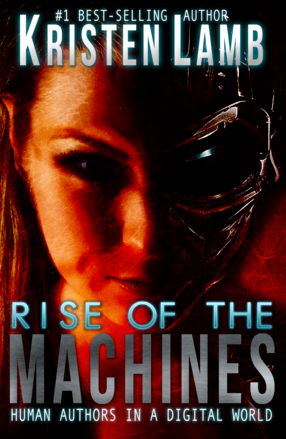 In fact, my last book Rise of the Machines (cover above) is much more than a social media book. I dedicate a large portion of the book explaining how the various forms of publishing work, because you need to make the best choice for YOU. I want that decision to be an EDUCATED decision. The problem with the ease of self-publishing is that it is, well, too easy. When we are new, frankly, most of us are too dumb to know what we don’t know. Just because we made As in English, does not automatically qualify us to write a work spanning 60,000-100,000 words. I cannot count how many writers I’ve met who refuse to read fiction, refuse to read craft books, and who only go to pitch agents when they attend conferences at the expense of attending the craft sessions. I see a lot of new writers who believe their story is the exception, that the rules make for “formulaic” writing. No, rules are there for a reason, and, if the writing is too formulaic, it has more to do with execution than the rules. Stories have clear beginnings, middles and ends. Without a clear story objective, it is impossible to generate dramatic tension, and what is left over is drama’s inbred cousin, melodrama. Yet, many writers start off writing a book without properly understanding the basic skeleton of story. Writing fiction is therapeutic, but it isn’t therapy. Yes, characters should struggle with inner demons, but that does not a plot make. Struggling with weakness, inner demons, insecurity, addictions are all character arc, not plot arc. There should be a core story problem that we can articulate in ONE sentence. The plot arc should serve to drive the character arc. If the character does not grow and change she will fail, but it is the core story problem that drives this change. Sometimes there are reasons we are being rejected and we need to take a hard look and be honest. Self-publishing is suffering a stigma from too many writers publishing before they are ready. If you really want to self-publish, I am here to support you and cheer you all the way. Heck, I did it. Will probably do it again. But remember, though the stigma IS fading we have to write better than the traditional authors. I see a lot of writers rushing into self-publishing without properly preparing to be a small business, yet that is exactly what we are. When we self-publish, we take on new roles and we need to understand them. We need to be willing to fork out money for proper editing, cover design and formatting. One of the benefits to traditional publishing is they take on all the risk and do the editing, proofing, etc. When we go it alone, we need to prepare for some expenses and do our research. We can be told a million times to not judge a book by its cover, yet that is exactly what readers do. Additionally, we may need to look into becoming an LLC. We need to set up proper accounting procedures and withhold the correct amount of taxes, unemployment, state taxes and on and on. There are a lot of writers who mistakenly believe that self-publishing is an easier and faster way to fame and success. Yeah, um no. And those magic beans are really just beans. Sorry. Self-publishing is A LOT of work, especially if we are starting out this way. If you didn’t defect from traditional publishing and can’t slap New York Times Best-Selling in front of your name? Prepare for a ton of work. Not only do we need to write good books, but we need to write prolifically. When we self-publish, we need a much larger platform because we don’t have New York in our corner. This is one of the reasons self-publishing isn’t for everyone. We need to look at how badly we want the dream, and then ask how many hours are we willing to work? What are we willing to sacrifice? There are a lot of problems with giving books away for FREE! We shouldn’t be giving away our work unless it serves some kind of a strategic advantage. There are ways to effectively harness the power of FREE! but too few writers understand how to do this and they just end up giving away their art for no tangible gain. This goes with my above point of us needing to understand the business side of our business. When we do choose to give away stuff for FREE! it needs to serve longer-term business goals. They fill up all the writing hashtags with link spam promoting their books. They keep futzing with the cover, the web site, the promotions. They do blog tours until they drop, and they do everything except what is going to help that book sell a ton of copies…write more books. In self-publishing, we can make our own schedule, but it still takes THREE BOOKS MINIMUM. I know there are exceptions, but most self-published successes hit at about book three. The ability to offer multiple titles is a huge advantage. Just make sure they are good books ;). Even I am putting my nose to the grindstone to come out with more books in the next six months. I don’t tell you guys to do anything that, I myself, am unwilling to do. I have two books in a series already written, but I’ve made the decision not to give them to a publisher or publish myself until I have a minimum of THREE finished titles. This is a profession, not a playpen. Self-publishing is a wonderful alternative. Just because we self-publish doesn’t mean we cannot publish other ways, too. I’ve been saying this for a LONG time, but it bears repeating. I feel the author of the future will actually be a hybrid author, and I do believe that the ability to self-publish is challenging all of us to come up higher. We are striving to be better writers, to be better entrepreneurs, to get better at organization and time-management and to write more books and better books. If we can learn from these mistakes and grow, then the future is ours for the taking. Reblogged this on Stanislava Kohut. Absolutely! This is such a great article! I get people who come to me all the time wanting to write and self publish and I try to tell them these very things and they think I’m being a downer. I don’t think it’s a downer to be honest with people. I love your candor and honest opinions! Self publishing is a lot of work if you want to do it right. Thanx for this! I am now off to read your article about Free books 🙂 Merry Christmas! Write, (Edit), Publish, Repeat. Nice blog post. I’m going to be doing my first self-published novella series this year and am trying to understand the business. Thanks for the tips! #1!!! I can’t tell you how many indie books I read that would’ve been great had they revised and edited them. Thank you for taking the time to share your wisdom. I’ve been writing all my life and yet I hesitate to call myself a writer. I have just started blogging as a way for me to refine my writing, Grammer usage and voice. I most say that I’ve been forced to go back and re-learn all the rules of writing I’ve forgotten. After years of free writing I created a bit of a mess but it can be fixed. Again, thank you for sharing this valuable information. I absolutely agree with the post. I think point number 1 is more crucial than anything. I get a lot of requests for a review from indie writers, either through Amazon or through critique group. What I see most often is just heartbreaking. Poor cover, bad formatting, no editorial input. That totally erases my desire to look past the mistakes. Nobody can focus on a story ( no matter how brilliant, interesting, unexplored and innovative it is ), if the raders don’t understand what is the writer actually trying to say. Don’t get me wrong, I have been there too. But I learned from my own flops and I rather focus on writing, rewriting, editing, revising and repeating the whole process with each book. I also realized you won’t get some, until you give some. That means investing in a good looking cover that grabs the reader, running my polished manuscript through beta readers and investing into a professional editor, especially because English is not my first, or even third language. Thanks Kristen for the great article, I wish every indie and aspiring writer would take points. BTW I love the video. I have seen it already, but every time it makes me laugh. Sadly, there are plenty of those, who think just like that delusional boy/dog(?). I am pre-published and I have tossed out the idea of self-publish, at least for my first novel because of the editing issue. I send it in to a traditional publisher and they will want to make sure that it is good, if I self-publish could be utter crap. But I am way overwhelmed with submitting to a traditional publisher. What do you think of ebook publishers? Thanks for the reminders. I’m doing the work, taking classes, being prolific. I have nine books out, still waiting to be “discovered”. I’m tweeting, Facebooking, meeting people, blogging and have set myself up as a business. All of these were new for me so I’m growing! Excellent advise! I wrote my first book four years ago, rushed to publication, and jumped in to pen (Okay not a real pen) another. I moved onto the third, and somewhere in the middle it hit me that my first book was not as it should be. I liked the plot but I was NOW aware that my technique lacked what I had since learned along the way. I took the first book down, and one year later, rewritten and with an editor who knows his craft I have republished. I still have much to learn, however, the revised book is something I am proud of; in a broader knowledge of what makes a good book, rather than the yearnings of my ego. I love ready your posts. Thank you. Kristen, I love the way you clarify publishing issues that can be totally confusing to newbies like me. I’m still in the revise/edit process on my first MG novel and can see the possibilities for at least 2-3 books that can follow. I’m curious as to the wisest move concerning trying to publish the first book before or after writing one or more books to go with it. Can you help me out with that? Awesome question. As an unpublished author myself, I’m interested to hear the answer as well. Thanks for bringing it up! My fifth self-published novel, House Divided, is on pre-release sale at Amazon. When I began to self-publish in 2011, I knew my writing wasn’t good enough for traditional publishing, but I was confident in my story ideas. To get where I am today, I kept writing (! ), got feedback from a variety of sources, went to workshops, joined writers’ groups, and kept writing. The two keys to success IMHO are writing and feedback. If the feedback is good–if you’re brave enough to invite criticism from people like Kristen, then your writing will improve. If you believe your 4 and 5-star ratings on Amazon, then you’re deluding yourself and your sales will always disapppoint. Sorry, but them’s are the facts! Yes to all of this! Indie Publishing is not about “We can do what we want!”. We still have to follow the rules, we have to learn and know what we’re doing. And I really can’t take a writer seriously who doesn’t read fiction and doesn’t have at least one or two writing advice books on his shelf/e-reader. Writing is a craft and it doesn’t just fall from the heavens. Publishing is also a craft and we have to know how it works. I agree that a lot of writers self-publish before a manuscript is ready. I’ve read books that had a good story and likeable characters but needed the hand of an editor before they were really ready to be out in the world–typos, poor sentence structure, etc. I’m currently reading “Write. Publish. Repeat.” and the authors touch on a couple points you’ve made here–namely, publishing multiple books and properly using the “free” tactic. Good points here, Kristen! Excellent advice. I shared this with my two writing groups. my agent’s FB group, and my publisher’s Forum. Lessons to be learned here at any stage of a career. Many thanks for the clarity of this post. OM Gosh Kristen, thank you so much for introducing me to David. I lost it watching that video, So You Want to Write a Novel! LOVED it!! If I could kill you now and get away with I could! Hilarious! Thank you again, for offering such sound advice! Happy holidays girl! Kristen, excellent article for the author considering self-publishing. I would add another major consideration: marketing. Self-published authors must become experts at every aspect of marketing, and learn to use those tools. There is no major publisher to build the marketing plan for you, to tell you which tools are most effective at selling books, or to handle public relations. Self-published authors must do all those things for themselves. Without a willingness to spend the time, effort, and money necessary to do marketing, even the best self-published book will not sell. Very generous, illuminating post for wannabe self-published authors. “Yet, when I sent them my critique filled with pages of corrections, I would then receive a reply telling me that the book had already been self-published.” — I saw this happen all the time on peer-critique sites, and I had to wonder, ‘If they’ve already self-published, why are they asking for feedback on improving it?’ The answer, of course, was that they didn’t actually want feedback, they just wanted to circumvent the No Spam rules of the site. ‘Tell me what you think?’ is used as a thin disguise for ‘Buy my book!!! !” I am disinclined to purchase a book by an author who believes that their work is ready for publication despite requiring several pages of corrections per chapter (although perhaps that’s just unfair bias on my part). That’s not “unfair bias,” that’s a fair reaction to underhanded manipulation. This is vital advice for indie authors, and I mean it needs to be printed out and tacked on the fridge door. Marketing self published books required dedication and hard work, getting engaged in the community, being active in social media (and that does not mean spamming the amazon links to your book!) and writing MORE books. Amanda Hocking sold 1.5 million on Amazon as a self published author but she already published a dozen books and built a solid reader base over the years. She had been blogging everyday for 2 years before she started selling serious numbers. It takes a lot of dedication to blog everyday and interact with people in social media. It requires sacrifice and takes months, if not years, to build an audience who will buy, read and promote your books if they are good. Investing in a professional editor is also very important, it’s a business investment since self publishing is pretty much a small business venture as Kristen writes here. As another point, I don’t even show my chapters to my beta readers before I proofread and polish them to my best. If they really insist and I end up giving in to my impatience and send it anyway, I regret it later when they point out the grammar mistakes logical errors. Showing your text to anyone, even friends and family in raw draft state is like wearing your white shirt without inspecting it and walking all over downtown with nasty coffee and ketchup stains on your chest. It’s rather embarrassing. Always inspect it it meticulously before showing it around. This is something I find hard to get my head around – how does someone who never reads fiction expect to be write it! I’m almost 60, and have probably read up to 7000 fiction books in my lifetime. I feel I could write by instinct, but have the commonsense to read every book on the craft I can. All that knowledge is not enough as one still has to write a decent story. In the end, the reader decides. Thank you for this. A frank dose of reality for the self published author. Refreshing! Great stuff, Kristen. Especially #5. I know some folks who are story-savvy, willing to put the time and effort and money into things, but who still don’t understand that their best marketing strategy at the beginning (and later, but especially at the beginning) is writing more books. Great advice. I’m considering the possibility of self publishing in 2015, but I’m going to make darned sure I’m good and ready before I make that leap. Great article. Thank you for taking the time to write it. The biggest thing I have realized in self-publishing is becoming a business is so important! If you don’t learn the basics of business it can mean a heap of hurt later on! Glad I was informed before that happened and got my LLC before my first book was published. Great post! It’s nice to be reminded how everyone has to go through the hard work of writing and publishing! Self-publishing is an interesting topic, and there seems to be a lot of vague information floating around about it, so thank you for this realistic and helpful post! Another very informative post, thank you, Kristen. I’ve just downloaded Rise of the Machines onto my Kindle and look forward to reading it. Awww, thanks Hon. I really hope it blesses you. Reblogged this on Critique My Novel's blog for writers. Great post. Helpful tips to keep in mind. But what does one do in case of a non-fiction where you cannot make a serial set of books? You can just similar themes. I am thrilled to have found this site! So many truths in your post, Kristen. I also agree with many of the comments that #! is so important. I love reading indie books but lately I been reading books with good writing, well edited, but the plot is so weak it leaves me wondering why the story was written. A thriller should have a strong plot with good reasoning. Not some silly reasoning that only the writers feels. Thanks for your honesty. Hope many writers read this post to help them become great writers. Um, yeah. I pretty much did ALL of this when I first published my novel. I was too antsy to get it out there. I’ve since removed my book (despite all the errors, it did get some moderate to great praise, which was cool), to continue fixing it, and learning more about the business side of writing, which is something they NEVER taught me in college (where I got a BFA in Creative Writing, and a crap ton of debt). As an author who is published via small publishers and also self-published – you hit the nail right on the head with this blog. I edited a novel for a client and when she received the edits back, her next email to me was “The book was published 2 weeks ago. Are you sure these changes are necessary? My betas readers loved it and found nothing wrong.” Within her tale, which was quite good, she had at least 50-60 “she thought to herself” or “he thought to himself” lines. Not to mention lines like “He is was alone.” “Your going to need this.,” and “There hats fell to the floor.” I was paid for my editing but I don’t believe it ever saw the final cut. She received several reviews and the one thing that stood out to me was “Good story but the book needed to be edited.” seemed to the be theme. Don’t skimp on book cover and editing. Thanks for this post (and to TSRA for reblogging it). I’m so glad I had four books written before I even started to think about publishing them. I’m also glad I’ve been self-employed before. It definitely helps! But, every now and then, reading posts like yours gives me a chance to rethink the strategy, check where I am, and gather the strength to push on! Perhaps the primary advantages of self publishing involve the shorter elapsed time from writing to print, and the control of expenditures. In this manner agents and query submissions are avoided. ideally, if one has the time, conventional publishing would be ideal; distribution and promotions part of the package. Finally, consider the volume of written works produced worldwide annually which is unfathomable. Best bet: be a celebrity, the doors will sling wide open. So then, what’s your strategy with those three books? If you self-publish them, would you publish them all within a close time proximity so prospective readers have the three choices right from the get-go? Or would you publish them a year apart like the traditional publisher does? Would depend on how fast a writer one is. I’d do three months apart probably and keep writing. Thank you for answering Kristen! And for always guiding us wanna-be’s. Happy holidays. Having said all that, the time since then has been a huge learning curve which I have enjoyed immensely! And it may have been even harder still trying to build an author platform with no published work to showcase. But it would have been nice to hit the ground running. My main aim now is to write, write, write. Major promotion will not take place until I have an arsenal of books worth promoting. Ms. Lamb? Once again you have hit the nail that is my head squarely! I am a Jamaican writer whose first novel (self-published through a US-based Indie publisher), a YA romance, was released on July 31, 2014. A sequel is to follow and, as such, I made a vow to complete same by November. I followed up with the Kindle version in September. After much back-breaking promotional effort via social media, tours, radio and TV interviews I have sold 50 paperback copies and only 8 eBooks. Needless to say, I have become quite discouraged and disheartened and disenchanted. My writing train lost steam and I suddenly felt like it made no sense to finish the sequel. I thought: “what’s the sense in spending money to put out Book 2 when nobody is buying Book 1!” For the first time in my life, I met Writers’ Block and lost all desire to do the thing I love more than anything else in this world. Now that I have read this post, I have to say that section about “one book to death” has resonated with me. I am now seeing things in a new light and will now be pressing on with the final installment which most of the readers have told me they cannot wait to get their hands on. I owe them that much, at least. But now I am also motivated by your words and my fervour has been refueled thanks to you. Keep on blessing us with your wisdom. One Love! Aw, thank you. Keep writing. You gain the benefit of compounded sales and new readers want to see you have more than ONE book to offer. So they love your writing but you only have one book? That can be a deal-breaker. Fantastic advice. My first two books were the products of someone who was definitely a newbie at self-publishing and didn’t do any research. I scrapped the originals and came republished them this summer, after hiring a new editor and cover designer. I would also add that, indie or traditional, beta readers are essential to improving a story (you probably knew that, but I’m saying it anyway). There are plenty of traditionally published books with weak story lines and plot points that don’t add up, weak character development, etc. It helps to have friends who enjoy the genre you write in and are willing to be brutally honest. I think you’re spot on. I’m definitely new to the game, and I believe my biggest related issue is #2. It’s not that I don’t understand the technical aspects of running a business. That part I realized in advance and expected. I have a bit of experience on that side. The aspect of it that truly has had me spinning my wheels is THIS particular business. There is a large difference between selling physical wares, that people can decide in a glance if they like, and something as complex as a book. Some of the basics are the same, but I still haven’t gotten the knack for the ‘spreading awareness’ side of things. I think once I finish up the rest of this series I’ll have more to show off. Kristen, your blogs are always inspiring and upbeat. I also meet aspiring writers who don’t read other people’s fiction. They also don’t think they need to edit. Will re-blog on Susan Pope Books and Medway Mermaids. Reblogged this on Susan Pope Books. An interesting article to read. You highlighted a few things I have never thought of though, as a reader, I have noticed those writers who do take the time to have their work edited. Reblogging as a) I’m a self published author and this sounds like a good sanctity check, b) I’m a communications professional in my day job, and this sounds interesting, and c) any post which references Office Space automatically gets a tick in my book. I am new to the idea of self-publishing, yet I’m too much of a realist to expect much from the traditional publishing world. I’ve heard before that nothing like novel #2 will do the job of selling novel #1, and nothing like novel #3 will do the job of selling novel #2 and novel #1. But I’m a slow writer. I’ve just now finishing up on novel #1 after a little over five years of writing. . . and it’s been a wonderful five years. I loved every minute of it. I’ve already got the idea for novel #2, and I’m thinking that now that I’ve had some novel writing experience, I will likely be able to write #2 faster. Like maybe in four years. And, if all goes well, I’ll have another idea for novel #3. Maybe I’ll speed up more and get that one done in three years. That would take me to, uhm, I’m not good with math. Let’s just say that if I want to self-publish all three, and I want to space them six months apart, then I should publish #1 in the year of. . . halfway to forever. So, what do you think? Novel #1 isn’t time sensitive. It’s got very little technology and very few cultural references in it. Should I wait until halfway to self-publish it #1? Reblogged this on Lead Writer. Spot on. The first person to school me was Kim Harrison and she was classy about it. I did decide to self publish and no I’m not a millionaire. 🙂 Reading is my first passion and writing is my second. Three of my books are out, edited and with professional covers in my series. I encourage any author out there to research, research, research. It’s going to seem overwhelming! It will be alright. Also, you need other creators in your life and they can be hard to find. Sometimes it’s frustrating. The best decision I ever made was to attend the WTWA course at West Texas A&M in Canyon, Texas. Look it up. I felt lost in the beginning and bungled and bumbled around hilariously until I got pointed in the right direction! Enrollment begins every January. And no, I’m not spamming – they saved my sanity! Before you go indie think once, think twice, think three times and be sure you’re ready . . .
Reblogged this on E J Frost. Excellent tips. I wish I’d read this a year ago! All right all of you writer-types – how many of these mistakes have YOU made??? Thanks for this article, Kristen. It came just at the right time! I’ve read the advice you give in Mistake #5 many times before, but your delivery of it has hit home. Thank you so much! Now I really will put that next book together instead of just thinking about it. A great post about self-publishing too soon. When should you actually take the leap? Thank you for another great post on the process of being a successful self-published author. My biggest challenge is consistency in marketing when I’d rather be writing. Like a few others commenting here, I write slowly (typically 2-3 years between books), so I did hold back e-pubbing Book 1 until Book 2 was nearly done and launched them within 4 months of each other. But Book 3 will take another year. Maybe I can improve my overall productivity, but truly, as an OTA writer (older than average), I still want that story to shimmer perfectly. The flaws you itemize here I see over and over again in writers I meet. Your website is always on my handouts — and today, I learned something new: reblogging! All the best to you for another fine year. I am reblogging this for a number of different reasons, not least because I need to be able to find it… and find it quickly! Oh, I was SO eager to get my baby out there for all to see, but books take time, patience, and knowledge to construct. I still believe the concept is great, but one day I will take it down, put it back into the crucible, and not let it out until it has metamorphosed into the shining star that it is supposed to be. But good things come to us when we need them, don’t they, and Kristen’s advice is no exception as far as I’m concerned. The truth is that I needed to fail the first time. Yes folks; there’s the truth. I needed to remember, with exquisite pain, that you can’t just write your heart out, do a bit of editing, and toss your work out for all to see. OK, well, you CAN, but it probably won’t work out the way you want it to. If we expect people to buy our book, read it and give it a good review, we need to offer them as well-crafted a book as we are able to produce. It this means slowing down, studying, researching, completely rewriting, and rewriting again, so be it. Thanks so much, Kristen Lamb! The next one will be different. Only three books? Sigh. I just published my seventh and I’m still struggling like crazy for just a few sales. And, no, I don’t think I published too soon (at some point you’ve got to publish or give up). I do believe that to a certain degree, the business side takes more talent than the writing side does, though. Thank you! This is a great post. I’ve written and edited book 2, and was thinking of self publishing it in February. After reading your post, I’m going to hold off until I write book 3. Love this. I’m considering going hybrid and here I am doing my research. Most grateful for your insight. Absolutely I believe luck is involved in good sales. It’s like hitting a dartboard. However, one’s “luck” increases if one makes the target as big and close as possible. Why on earth would anyone choose to make the target any smaller than they had to? Right now, my biggest sticking points is effective marketing. You might have put out the most brilliant book in the world (oh yeah. that’s me! ), but if nobody knows about it, nobody will buy. Great post, I agree with you 100% and am definitely bookmarking this page!!! I think one of the most important points you make is to keep publishing: not just books, but also short stories or magazine/newspaper articles. I’ve heard of the magic three books scenario, actually I heard it was five books that turns the corner. The key is that the more we write the better we get as polishing the craft of writing. Self-pubbed authors must be willing to hire editors and book cover designers so their work can be as professional as possible. Some really important advice here for self-publishing authors, whether newbies or not. If we want our work taken seriously, we cannot afford to make these mistakes. Such important advice to take note of. Thank you Kristen. Great advice for self-publishing authors! Can I repeat that “This is a profession, not a playpen” line? Please? Pretty please? Excellent article. I particularly agree with the idea that hybrids are the wave of the future. Great advice which I will read again and again to be sure. I love this post Kristen. And I wanted to wish you and your family Merry Christmas and a Happy New Year! All the Best to you!! Reblogged this on Robert Malloy . I’ve been putting off starting my second book waiting to hear from agents, writing more queries, etc. I love your advice about having 3 books. Makes so much sense. I am SO No. 2 , which means I am also No. 3, 4, 5 — my 2015 amounts to learning marketing. Thanks for the blog. It hit home. Cracking post and so true. There is a lot to think about further than just publishing your book. I especially liked THING 1. So many authors do publish their books before they’re ready. I’m so glad e-publishing wasn’t an option until mine were or I’ll be I’d have been one of them. Too powerful not to share. Happy Holidays Kristen! Thank you for confirming what I suspected, that along with being a self published author most likely comes the added responsibility of becoming an LLC. I see the work that my partner puts into fer LLC weekly and it can be hellas lot of work. And that in addition to the hours writing. Again some sobering as well as wonderful insight shared from your experience. Thanks so much. The thing is I give it away for free but I have a strategic plan for it. Thank you/I recently bought your book, “Rise of the Machine” and immediately began putting your advice to work; I was one of those “Water Cooler writers” you describe; I had a blog that was set up exclusively to be a writer’s blog, or more specifically, a poetry blog—needless to say, it was a stagnant blog for two years; but I took your advice and let my personal interests in: fantasy lit and movies, genealogy—and sure enough, stats are picking up on my blog, after two years of nothing. The amazing thing is I’ve only gotten through half of the book. I’m excited to see what my blog is going to look like when I finish the book—thanks again for an important and useful book. Really enjoyed your tips. I’m new to writing and am currently doing some rewriting of my novel. This time last year I had no idea that i could have done what i have so far. You are right….the writing must be the best it can be not just for the readers who expect to pay for a quality product but for the legacy each writers leaves as their footprint in the world of the written word. Thank you. As a newbie, I appreciate your advice regarding the self-publishing option. I really needed this advice. Thank you! Very well analyzed Kristen! Thank you! Excellent article! I have spent months trying to get three aspiring writers to understand the points you made so eloquently, so sent them the link to your article. Perhaps they will understand what you said — they didn’t seem to “get it” when I tried to explain the three act structure — perhaps I made it too complicated by showing them a diagram of Christopher Vogler’s ideal plot. Thank you for taking the time to write and share. Hi Kristen, loved this. I am recently coming back to writing. I’ve half written a few novels and I’ve just started a new project. I will probably go back to the first projects at some point….. However, the story and other points you mention in your blog are just so critical, as is an understanding of the difference between themes, concepts, plots and dramatic arc. Because most people don’t think the rules apply to them and they so do…. One of the most amazing books I’ve read recently is “How to Write a Novel: 47 Rules for Writing a Stupendously Awesome Novel That You Will Love Forever” by Nathan Bransford, I’m certainly going to be picking up your digital book too. I really got it and laughed a lot at this book. I recommend anyone trying to write, to read and read a lot. I find when I’m writing, I read with a different eye… But first and foremost READ!. I’m pretty sure there’s only one book in me. Two at the outside – in very different genres. What does your perspective suggest for the one-book writer? Give up all hope of acquiring a reasonable number of readers? The most helpful post I’ve seen for new writers who jump into publishing before they really learn to write well. I give this advice when I speak to groups and on my blogs. So many people I know have retired and want to write and publish quickly because they don’t feel they have that much time left. I like that you suggest taking classes and learning to write well. I am going to mention this post and link to it on my Writers Circle around the Table blog. I saw the naked truth about myself- the self-published author, and the the humor from David Kazzel, it was just a killer :-). It made me chuckle a few times. I am printing the article to read and highlight. And i will get back with a real reply.